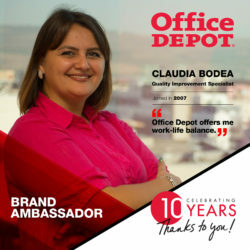 Office Depot started the Cluj-Napoca chapter in 2007. Since then we became a steady point of reference at offering excellent operational support. As a celebration for being here for 10 years, we are really glad to present you our Brand Ambassadors. Every week we will post an interview with some of our associates who are role models in their area. They are sharing their journey and offering advice on how to achieve success. We hope this will inspire you to join our winning team! Today we will tell you the story of Claudia Bodea, our Quality Improvement Specialist. Being a gregarious person she doesn’t give up easily as she always finds new ways to learn from every opportunity. Below, you find her detailed trip in Office Depot. 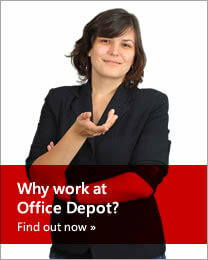 Tell us something personal about you and about your role in Office Depot. The first thing that comes into my mind from a personal perspective is that I’m a mother. I have a 2-year-old son who has changed our lives and has brought joy and meaning to everything. This would be one thing that would define me. Something that may also be interesting is that I have a tomcat. His name is Bubu. Work-wise, I am responsible for the Accounts Receivable France Region from the Quality perspective. This is a new role which I have since half a year ago; before that I used to work on the UK side of the business. That was from the very beginning until I went into maternity leave. So, I’m a bit of newbie when it comes to French. Now going back to the beginning of your journey in OD, can you share with us what your job title was on the first day? I was a Process Assistant for the assessment team for Irish accounts. It was just a single team dealing with the Irish accounts and all the rest were dealing with the UK customers. Everyone was amazed: “Oh, you’re dealing with the Irish guys! I could never understand what they say’’. I remember a funny moment when a client was telling me a telephone number and he started saying “not, not, eight, and eight”! I said: “Excuse me, could you repeat it?” The client said again “not, not”. And “not, not” actually means “zero”, as it comes from “nothing”. What do you remember of your first day at OD? Describe some memories of how it was back then. Well, I remember one of the first days when we were having trainings and we were all together in a large open space and we had a couple of team leaders presenting all sorts of things. We were happy because we were getting free sandwiches for lunch. We had extensive training – but not like now when new hires have the chance to practice on their own computers what the trainer is teaching them. I think Office Depot was one of the first companies to invest in people like that. We were all proud to be part of such company. What was the funniest moment which you experienced at the current role? What happened? Well, there is fun all the way. 3 persons who started 10 years ago are still part of the same team after 10 years and we still have the same team leader after 10 years. So, we do share a couple of pages like a Wall of Fame with our brainless moments. I had one customer on the line that kept on thanking me saying how much I helped him and I was confused because I didn’t know how to end the conversation. And in that moment I said: “Thank you, you make flush”. Actually I wanted to say “you make me blush”. And my colleagues just started laughing. Another funny moment was when a colleague of mine was saying: “What? Big toilet paper? Do you want to return big toilet paper?” And we all started to laugh, as he was so surprised that a client was not happy with the color of toilet paper. And it was funny especially because in this context of highly professional associates we were talking about this. What was your biggest achievement up until now? Most definitely the maturity I gained beside the role and the responsibility and the changes that happened in the personal plan as well. Because here we really invest in coaching and in the development of the individuals. And if someone is serious enough to develop themselves and become a better person it’s the place to be. This is one of the reasons why I remained here in the company. Another reason would be that I had the chance to work with great mentors (team leaders) who guided me, believed in me and made me believe that I can achieve a lot of things. Give us some tips on how to achieve success in one’s career. I think it depends on what success means to each of us. For me success means gaining knowledge and experience. I had a teacher at the university and she mentioned something about continuous education. In this period it is important to remember this concept because you never know how jobs are changing, so it’s important to keep pace with the changes. You need to have an open mind and learn from everything that happens around you. That’s what success means to me. Well, I do know that for some success means being a manager overnight and in this case they will be disappointed. You cannot get there easily and if you do get there you will be confronted with many situations that might put you to the ground. A tip for students would be to take their time and be happy for this experience and try to gain as much as possible from every opportunity. Because you never know in life when something would be important for you or will change you. What were the biggest challenges which you faced here? How did you manage to solve it? One of the biggest challenges in the early days was really learning how to be organized and how to prioritize things in order to finish all the tasks. And another thing related to this one would be to work with baby steps. Every small achievement is an important achievement. For example, if I didn’t become a team leader by the end of the year that isn’t a terrible thing, as long as I managed to achieve the outgoing calls that were set as a target at the end of the day or at the end of the quarter. Another challenge is when you do a repetitive task – it’s important to have something to motivate you on the long term. The key for me was to get involved in additional projects, developing in another areas: delivering trainings to others for example. What are the top 3 things you love about OD. Individual development plans: we always try to put ourselves in situations that we are not comfortable with, just to learn to overcome our fears. My colleagues: there is a nice atmosphere and I do feel like home – after the years spend in maternity upon coming back I still felt being part of everything. The role which I am having now implies collaborating with many other departments and it was nice to come back in the company and have the feeling of returning home somehow. It’s more than a job; it’s a place where you put passion and energy in what you do. Balance between professional and personal life. It’s important to invest in your career and at the end of the day it’s what you have at home that gives you energy and drives you to do more. I wasn’t bored in those 2 years when I was staying at home with my baby. It was a wonderful period because I invested a lot in myself, reading about how our brain works, emotional intelligence, etc. I felt that I am good at being a mom, but I feel that I am so much more than this. And I came back with a lot of energy and wanting to combine the two roles. Congratulations Clau! 🙂 Keep going and keep smiling!